“Los Angeles has never been a city that can be measured by its verticality. It’s a horizontal place, which can lead to charges of sprawl from those looking for a high-rise skyline to orient themselves by. L.A. has no center because it has a hundred different centers.” Building off her disappointment with the “sparkling and soulless” future Los Angeles envisioned by Her, Molly Lambert sings the praises of the city’s downtown, and highlights some landmarks that have done marvelous work in movies as noir, dystopian signifiers. 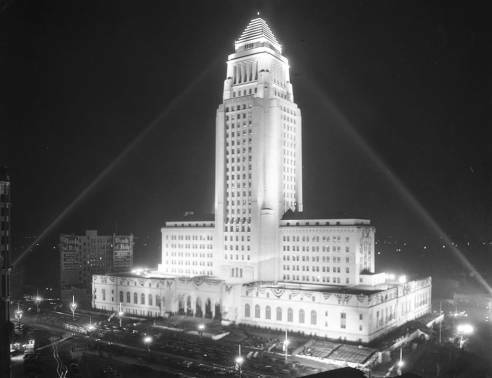 In related news, Dave Kendricken explains how L.A.’s (and New York’s upcoming) transition to LED street lights means movies drenched in the orange-hued nocturnal atmosphere of sodium lamps are about to become historical documents as much as any panning shot of buildings long since demolished. Via Gizmodo. “Schrader speaks of how “cool” the movie is, but cool is what Quentin Tarantino achieved when he lovingly appropriated “Putting Out Fire” in Inglourious Basterds. Cat People definitely wades straight into Uh-Oh, It’s-Too-Late-To-Stop-Now territory; smart folks like to bandy around concepts like “transgression,” but leave it to an erstwhile Calvinist to really hit the self-crucifying nail on the head.” Howard Hampton is terrific on Paul Schrader’s most notorious mix of mainstream chic, arthouse rigor, and his own furious, volatile confessions. Via David Hudson. “I stay at the best Club in the city where all the millionairs belong in fact I have a good sane, wholsome time. I am living well. I have my own valet, some class to me eh what?” At Letters of Note, Charlie Chaplin’s entreaty to brother Sydney to come join him in the land of milk and honey, the frequent misspellings reminding you young Chaplin lacked any formal education, the savvy negotiation advice confirming how irrelevant that was to his genius. Ellen Copperfield relates another immigrant’s tale of Hollywood: Ingrid Bergman’s, the “country girl” of Swedish stage, nervously fighting off make-up tips and consoling herself with bowls of ice cream. At the end of her article Copperfield appends a letter from Rossellini to remind you of the affair that launched a thousand outraged editorials. Shane Brown looks back at the “first scandal to rock the modern celebrity world,” and the birth of the press’s current exploitive relationship with the stars it covers, recounting the curious death of Jack Pickford’s wife Olive Thomas, and the New York Times’ determined effort to milk the sketchy circumstances for all they could. The notion that lack of means breeds innovation is borne out by the credit sequences featured in Ben Radatz’s overview of B-movie titles, from the hard-hitting, neon or brick emulating typefaces of ’40s noirs, “grounding their films at street level,” to the animated optical effects of ’50s sci-fi. A further installment on ’60s Bs is forthcoming (we’ll let you know). If you think a survey of the various typographical fonts on display in 2001 is a bit pointlessly obsessive, well, one, Kubrick; and two, Dave Addey’s witty account shows off the film’s scrupulous attention to contemporaneous branding—by NASA no less than Howard Johnson’s—and allows you to contemplate the gulf between The Dawn of Man’s Albertus and Beyond the Infinite’s Futura. The Black List meets the Bechdel Test, as the Athena Film Festival selects the four best unproduced screenplays to feature a female protagonist. Via Movie City News. “But it was at the point before Johnny’s career was going that way [makes whooshing upward gesture with right arm] with Pirates and Robin’s was going that way [whooshing downward motion with left arm], and we couldn’t get the money.” Terry Gilliam talks with Indiewire’s Jessica Kiang about some of his unrealized projects (including, yes, Don Quixote) and his cameo in the Wachowskis’ Jupiter Ascending. Richard Harland Smith gathers a gallery of film grabs to buttress his argument that, when it comes to horror films, even close-ups of the actors’ faces were more creepy and unsettling before CGI came along to tortuously distend every wild eye and manic, death’s-head grin. In honor of the Film Society’s Masterpieces of Polish Cinema series, Adrian Curry gathers ten different posters for Kawalerowicz’s Mother Joan of the Angels, each striking in their own way though they range from vivid abstractions to such reliable old-school tropes as a tearful embrace across prison bars. Video: Jonathan Crow gathers the three available ads (out of four) that David Lynch shot for Calvin Klein’s Obsession. Literary-themed and full of surface beauty, these probably land more firmly on the mainstream side than any of Lynch’s many attempts to compromise his sensibilities with commercial mandates; but some flourishes bubble up nonetheless. Philip Seymour Hoffman. Age 46. David Hudson collects the words at Keyframe. Nothing for me to add. Maximillian Schell, Oscar winner for his American debut in Judgement at Nuremberg, passed away at the age of 83. He was also nominated for The Man in the Glass Booth and Julia and was a director in his own right (including two fine personal documentaries, Marlene and My Sister Maria). Brian Baxter surveys his career at The Guardian. Eduardo Coutinho, celebrated as one of Brazil’s greatest and most influential documentary filmmakers, died at the age of 80, allegedly stabbed to death by his troubled son. Pablo Villaça explores the legacy of Coutinho for RogerEbert.com. Christopher Jones, the star of Wild in the Streets and David Lean’s Ryan’s Daughter, retired from acting in 1970 and, apart from a brief appearance in Mad Dog Time, never returned to the screen. He died in Los Angeles at the age of 71. David Colker at L.A. Times. Ann Carter, a child actress in the films of 1940s Hollywood, had a starring role in Curse of the Cat People (one of the great films of childhood imagination) and parts in I Married a Witch (as Veronica Lake’s daughter), Commandos Strike at Dawn (with Paul Muni), and The Two Mrs. Carrolls (with Humphrey Bogart and Barbara Stanwyck. She passed away at the age 77 after a long battle with ovarian cancer. Mike Barnes at Hollywood Reporter. Arthur Rankin, Jr., co-directed the animated features The Flight of Dragons and The Last Unicorn and produced Mad Monster Party but he left his greatest legacy on television, where he produced and/or directed some of the most popular animated holiday specials ever made, including Rudolph the Red Nosed Reindeer and Frosty the Snowman, as well as numerous animated series, from The Jackson 5ive to Thundercats. He died at age 89. More from Mike Barnes at Hollywood Reporter.